A stray shower or thunderstorm is possible early. Some clouds this evening will give way to mainly clear skies overnight. Low 56F. Winds ESE at 5 to 10 mph..
A stray shower or thunderstorm is possible early. Some clouds this evening will give way to mainly clear skies overnight. Low 56F. Winds ESE at 5 to 10 mph. 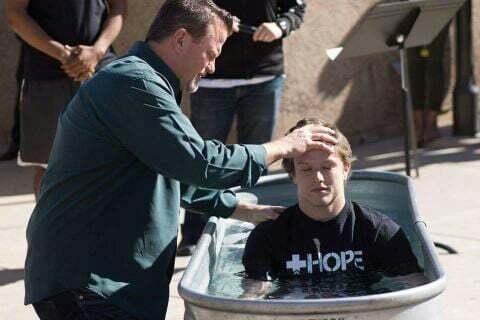 ASU student Steven Wicker, being baptized by Hope pastor Brian R. Smith, co-authored a 123-page complaint against the church last year. The days of receiving free rent from taxpayers are over for a Tempe church linked to a controversial campus ministry in Tucson. Hope Church of Tempe, found responsible for hazing and other misconduct at Arizona State University, has been stripped of membership in the school’s religious council and can no longer operate on campus at public expense, officials say. Hope has received more than $1 million in financial benefits over the past decade by holding its Sunday services for free in a campus auditorium that normally rents for $3,500 a day, the Arizona Daily Star calculated using university data. The religious council’s decision follows a recent ruling by ASU’s dean of students that found Hope responsible for hazing, misuse of student information and other misconduct. The church was also accused of sexually humiliating students. Five Hope student clubs also were sanctioned for misconduct for posing as secular groups to help the church recruit new members. “Protecting ASU students is of the highest importance,” Tracy Rapp, president of the Council of Religious Advisors, said in a statement explaining the recent council decision. “The actions Hope was found to have taken will not be tolerated by our organization, just as they will not be tolerated by ASU,” said Rapp, who called it “sad” that such a vote became necessary. Hope can eventually reapply for council membership, but not until 2021, when ASU’s recent misconduct sanctions against the church are to expire, Rapp said. The Tempe church was founded and still is led by former members of Faith Christian Church in Tucson, which more than 20 former members describe as a cult that operates at the University of Arizona. The UA investigated in 2015 but found no rules were broken. Hope’s leaders deny wrongdoing and say they cut ties years ago with the Tucson church. Head pastor Brian R. Smith criticized the ASU religious council’s decision in an email to the Arizona Daily Star. “This is a sad day for CORA,” said Smith, using the council’s acronym. “We are disappointed that the leadership of CORA held a vote on our membership over email,” he said, adding that council members weren’t given enough information before voting. Smith said Hope plans to keep operating on campus in some fashion. But that may prove challenging, the church’s online financial records show. Hope was able to secure free rent through its student clubs, which booked space for the church at no cost by telling ASU it was being used for club meetings, a Star investigation found earlier this year. The auditorium Hope has been using for free normally rents for $3,500 a day, which works out to roughly $140,000 for a school year. In 2015, the last year for which financial records are available online, Hope took in more than $1.6 million but had less than $30,000 left over after covering its other expenses. Besides losing free meeting space, Hope’s leadership also forfeits several other benefits ASU makes available to eligible religious council members. They include reduced rates for ASU athletics tickets and 75 percent tuition discounts for church leaders and their families. Hope Church is led by ex-members of Faith Christian Church, which runs a ministry at the University of Arizona.